The infographic, compared to the actual information, is obviously much more colorful but this infographic is interesting because it isn’t based on numbers but on observations of the human behavior. I mean, of course, this twitter information was probably made up by the amount, or number, of people that fit in a certain category and the source probably created this with the number of a certain kind of twitterer. They just classified a certain type of person from twitter using information they have to make overlying categories that most people fit into. This is taken as a subjective case compared to like the amount of plastic one uses because those are mostly numbers, but the twitter infographic is based on a sort of subjective view. The source would be muddled because one would have to do all the searching through the words but the infographic is already made with pictures and in color. The source is from Next Generation Online which is focused on technology, mobile, and web news. 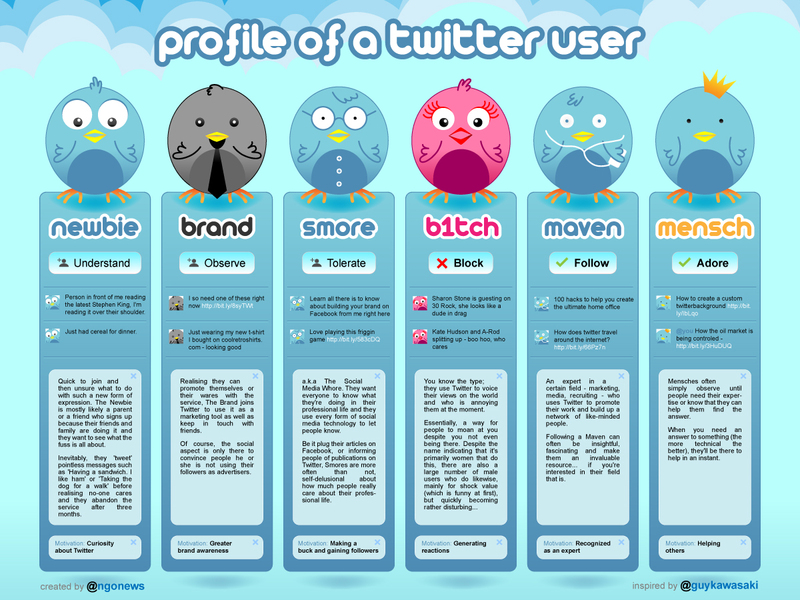 They probably created this through a long period of researching the different types of twitterers out on the web. They made it look like an actual twitter post which could catch people’s interest more than just graphs or charts. It clearly adds a more visual, colorful, and most of all easier way to see all the information all in one place. It has interesting birdie characters that most people can enjoy.